An approach to long term dividend investing with quality banks. An approach to dividend investing dividend growth and reinvestment of payouts. Several investment options that offer greater than 3% annual dividend return. Market fluctuations have the tendency to make unsecure investors nervous. History will show that over the long run, even factoring in periods of market volatility; equities generally provide the best return on investment for retail shareholders. When dealing with market fluctuations one of the keys to success is simply to remain calm. It is important for retail shareholders not to sell their positions during short term fluctuations in the market. Simply put, short term fluctuations should not impact buying and selling decisions for long term investors. To extend on my thoughts, I highly recommend young investors to begin accumulating a position within the Canadian banking sector. If an investor approaches investing with a long term plan which includes not allowing short term market fluctuations affect their buying and selling patterns then they will be in a very good position to reap the long term benefits of Canadian bank shares. Historically, Canadian banks have gone up in value, but there have been times that they significantly decreased in value, such as in the 2008 global financial recession. What remained consistent is that they have always increased dividend payouts over time in parallel with growing profits. As the banks grow their dividends, investors who hold their positions reap the most benefits. Once the investor takes a position the cost of the stock does not change. but ideally the dividend that the investor receives will increase over time. Therefore as dividends rise the yield also increased on the shareholders shares. The Canadian banks each have their own story and unique areas of growth but are all highly profitable, with strong dividends and fundamentally sound organizations. It is in my opinion that at present there are very few reasons to believe that the value of Canadian banks should decrease in the near or midterm. One approach to the sector is to build a position and reinvest the dividend payouts. In addition, contribute by increasing the originally position regularly or in line with the dividend payouts. The investor could reap the benefits through of the dividends, increases in the dividend payouts and possible through appreciation in the stock price. Lithium batteries have dominated the consumer market while new applications such as electric vehicles propel future demand. Asian companies race to lock up lithium demand while they increase their battery output capacity. Asia has been forming strategic alliances, joint ventures, and acquisitions with lithium exploration companies worldwide. Lithium has been one of the cornerstones of success for the mobile phone, smartphone, laptop, and tablet PC markets over the past decade. Lithium batteries for consumer electronics is an area that has seen significant growth due to population increase, increase in buying power in developing countries, and price decrease in electronics. Lithium ion batteries are at the core of many consumer electronic devices for their ability to withstand memory effects, slow discharge when in standby, safety features, and high energy density. The true tipping point for lithium-based batteries will be found with the widespread adaption of hybrid, plug-in-hybrid and full-electric vehicles, coupled with the growing need for utility-scale, grid-tied energy storage. Lithium supply security has become a top priority for Asian technology and manufacturing companies. Strategic alliances, joint ventures, joint ventures and acquisitions, continue to be established with lithium exploration companies worldwide. This will ensure a reliable and diversified supply of lithium for Asia’s battery suppliers and vehicle manufacturers. With lithium carbonate being one of the lowest cost components of a lithium-ion battery, the issue that Asian companies are addressing supply security attained which can be achieved by acquiring lithium from various lithium producers. These measures have been ongoing since 2009 which has seen Asian companies establish joint venture and acquire existing producers. These strategic moves have allowed battery and vehicle companies to alleviate the possibility of future lithium supply disruptions, which could have devastating consequences in a well-established and productive HEV, PHEV, and EV industry. Consider that both Korea and Japan, who are amongst the largest producers of lithium ion batteries have no lithium hard rock or salar brine deposits within their borders. Lithium demand has doubled over the past decade and is expected to double over again by 2020.
Review of the lithium oligopolies’ production capacity, location and recent investment in production expansion. A possible low cost producer backed by Toyota could join the lithium oligopoly. With the volatile global markets and gloomy headlines, it is easy to lose track of the strong underlying fundamentals at play in the lithium sector. Unlike many other established commodities that have mature but cyclical end markets the use of lithium as more than a niche commodity is an emerging phenomenon. While demand has not been completely immune to macro economic trends, it has been rather resilient. 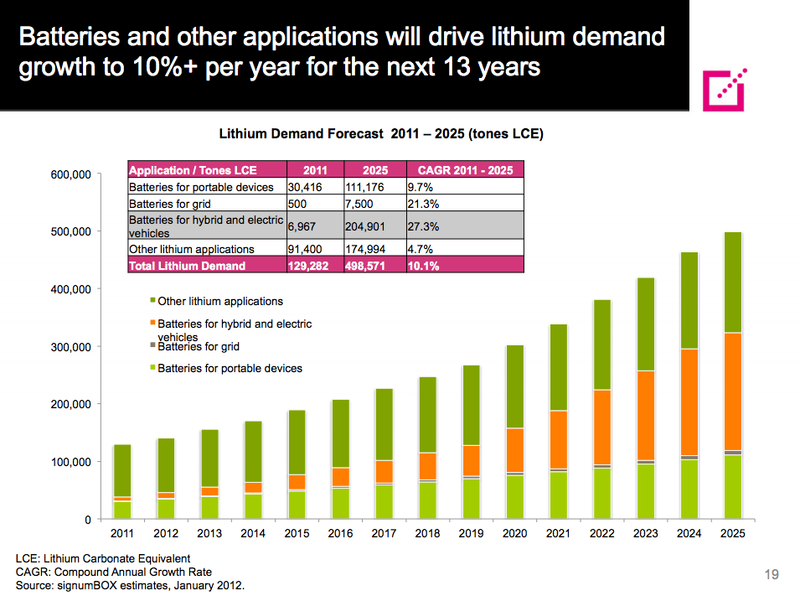 Lithium demand has doubled over the past decade and is expected to double over again by 2020. What is primarily driving demand currently is the rapid adaption of Lithium Ion batteries in everyday consumer and hardware applications along with the uptake in new applications such as stationary energy storage and the widespread uptake of hybrid and electric vehicles such as those produced by Tesla Motors (TSLA). On the heels of these trends, there have been a flood of new investments, acquisitions, mergers, and price increases within the lithium production industry. The top lithium producers, which are an oligopoly in the market have recently further consolidated the industry. This was accomplished in 2012 when Chinese lithium-giant Chengdu Tianqi acquired 100% of Talison Lithium Ltd., which owns and operates the Greenbushes hard-rock spodumene mine in Australia. The deal was an all cash transaction valued at $850 million. In 2013, Rockwood Holdings Inc. said that it would acquire a 49% stake in Talison from Chengdu. Collectively, today the lithium oligopoly accounts for almost 95 percent of global lithium supply including Soc. Quimica & Minera de Chile SA (NYSE:SQM), Rockwood Holdings Inc. (NYSE:ROC) and FMC Corp. (NYSE:FMC). Overview and History of The Puna Plateau. Update on what is happening in: Bolivia, Argentina and Chile. Review of investment opportunities with leading chemical companies operating in the region. The Puna Plateau is an area of the Andrean Mountains that reaches elevations of 4,000m and spans 1,800km across Argentina, Bolivia, and Chile. It houses the largest proven deposit of lithium, referred to as the “The Lithium Triangle,” and consists of three major salt lakes: Salar de Atacama, Salar de Uyuni, and Salar de Hombre Muerto. The Puna Plateau is referred to as the “Saudi Arabia of lithium” as it holds approximately 70% of the global reserves, making it an attractive area for both junior exploration and large mining companies. ‘Brine’ is water saturated with a high concentration of salts such as that found in salt lakes, or a salar. Concentrated brine water is extracted from below the Earth’s surface and cycled through a pond evaporation process, which can take from 12-24 months; as the brine water begins to evaporate, lithium and other by-products are harvested, including potassium and boron. In the 1990s, a large investment of approximately $150million by an American chemical company spurred interest in the Puna Plateau. In recent years, a significant number of junior exploration and mining companies have flocked to this part of the globe to unlock further value as the demand for lithium has doubled over the past decade and is expected to double again by 2020. The increase in demand comes from the rapid adoption of lithium ion batteries to a wide range of mobile applications such as cell phones, laptops, and power tools, but also its use in new and emerging applications like table PCs, smartphones, and electric vehicles. The largest deposit sits in Bolivia, a country that has decided to develop the salars with little external support. But in late 2011, the Chinese state company CITIC Guoan Group Corp announced that it had reached an agreement to begin exploration in the Salar de Coipasa. Later in 2012, a consortium of South Korean firms announced that they would build a pilot plant to manufacture lithium cathodes, the main component in lithium ion batteries. Major South Korean electronics firms, such as LG (NYSE:LPL), have indicated that they are seeking to be the number one producer of lithium ion batteries in the coming years. Industry watchers, however, have seriously criticized the Bolivian government for making such slow progress on the project. It is even doubtful that these projects will see life in the coming years as the immediate future sees supply being brought in from Argentina and Chile.